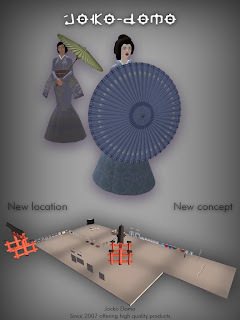 Taiko (太鼓?) 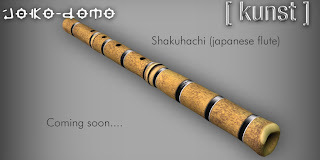 means "drum" in Japanese (etymologically "great" or "wide drum"). 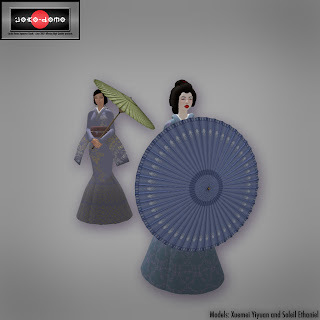 Outside Japan, the word is often used to refer to any of the various Japanese drums (和太鼓, 'wa-daiko', "Japanese drum", in Japanese) and to the relatively recent art-form of ensemble taiko drumming (sometimes called more specifically, "kumi-daiko" (組太鼓)). 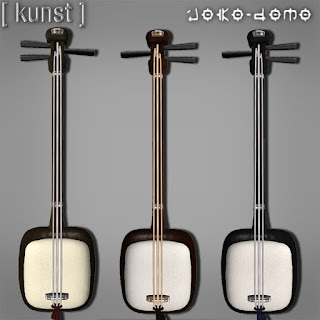 The shamisen or samisen (Japanese: 三味線, literally "three flavor strings"), also called sangen (literally "three strings") is a three-stringed musical instrument played with a plectrum called a bachi. Styles: Metals, Fabric, String, Wood, Sking, Itomaki all customizable with different textures to choose from! Size Changer: Small, Medium, Large and "++", "--" buttons for fine adjustments. 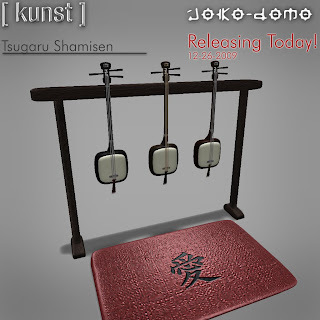 Sit height adjustment: we know that sit height is a pain in SL so, the rug includes a menu to adjust it. 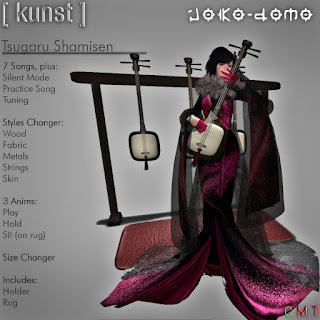 The rest of the song were taken from Tsugaru Shamisen by Takahashi Chikuzan a traditional shamisen player. Realeasing Today, in a few hours, more info and a formal post coming soon! It comes with a candle. You can choose different colors. 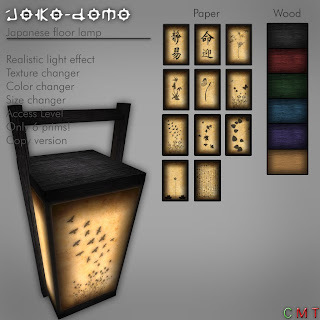 Japanese paper lamps are a very important symbol in asian culture, they are not only used for lighting, but also for festivals like Obon where floating lanterns are placed on a river stream to represent our friends that are not longer with us. 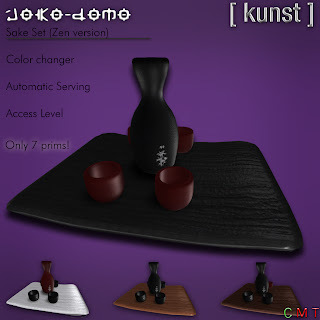 I was very inspired when I made these ones, I wanted it to be very functional and customizable. 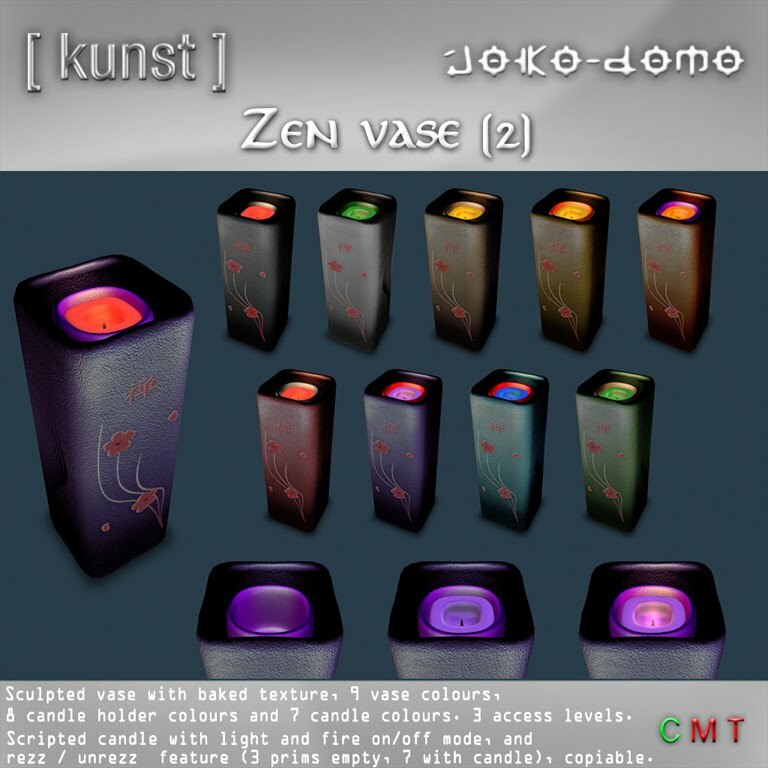 The light script changes luminosity and glow randomly like if there were a real candle inside. 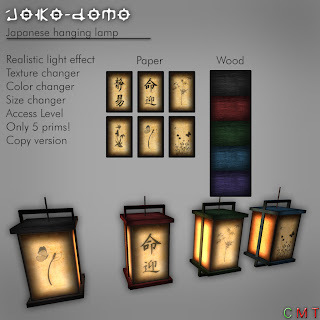 Also you can change wood color and paper motif, giving you a lot of combinations. Finally, in the ceiling version you can adjust cable's size automatically with menu buttons. 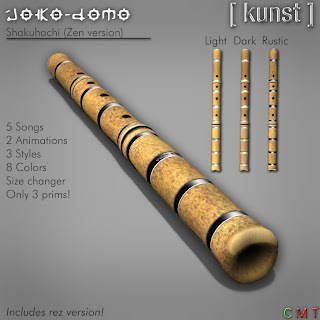 Shakuhachi (Japanese Flute) Zen version. Kunst Himmel made an amazing work in sculpts and textures on this one while I took care of the scripting only this time. 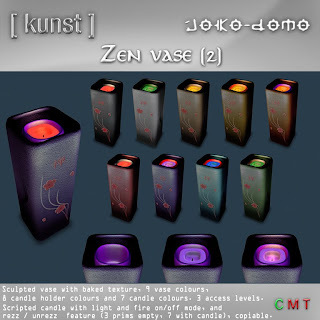 This is the zen version wich includes slow tunes ideal for story telling and for bringing peace to your soul. The second of the series will be called "Folk" and will include faster tunes wich a great player will record for me!. I will give more details soon, but in the meanwhile you can head out to Jocko Domo and try this one. 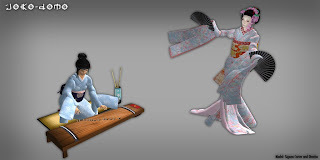 The koto (琴 or 箏) is a traditional Japanese stringed musical instrument derived from the Chinese zither (guzheng). 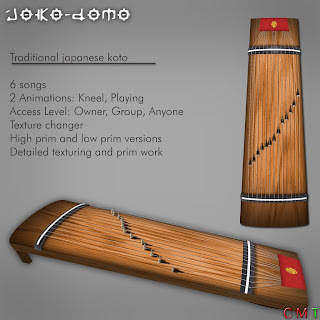 The koto is the national instrument of Japan. 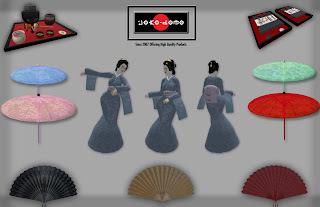 Koto are about 180 centimetres (71 in) long, and made from kiri wood (Paulownia tomentosa). Jocko Domo presents: Traditional japanese koto. Itsukushima Shrine (Japanese: 厳島神社, Itsukushima Jinja) is a Shinto shrine on the island of Itsukushima in Japan. The first shrine buildings were probably erected in the 6th century, but the present shrine dates from the 12th century. 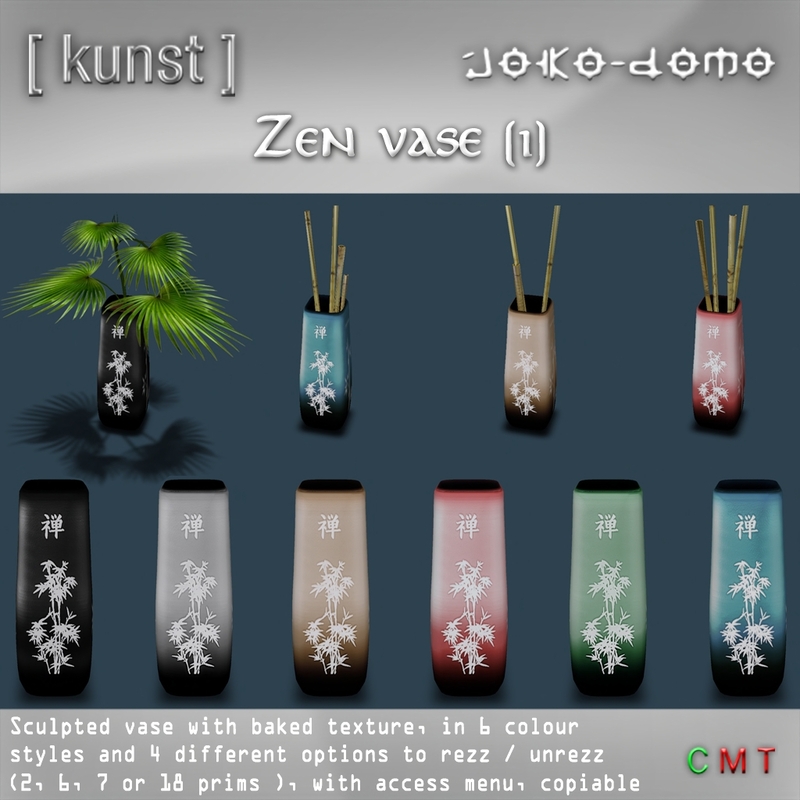 Jocko Domo & [ kunst ] are proud to present a virtual representation of one of the most important japanese cultural symbols. You can use this magnificent building to attract residents to your sim, it can be seen from a long distance and it will get people's attention very fast. 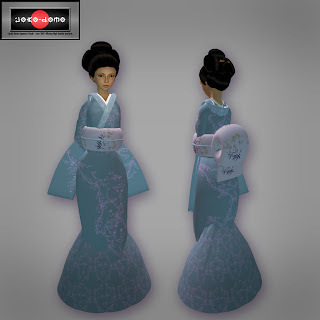 This torii is a [b]must have[/b] for every japanese sim. 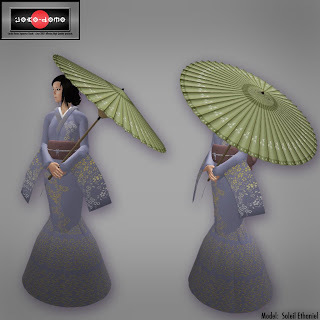 New Parasols, a big improvement in prim work and textures, compared to the first ones. 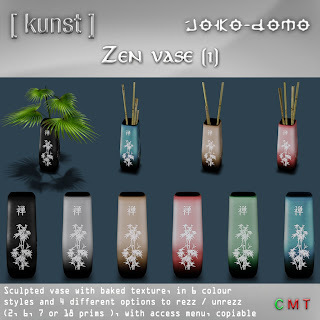 With hold anim and texture changer. 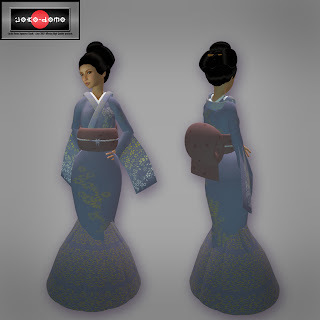 After a long time (a year) without making any kimonos, I decided to make new ones.